This article is about the set. For the card of the same name, see Duelist Alliance (card). Duelist Alliance, named The Duelist Advent (ザ・デュエリスト・アドベント Za Dyuerisuto Adobento) in the OCG, is a Booster Pack in the Yu-Gi-Oh! Official Card Game (OCG) and Yu-Gi-Oh! Trading Card Game (TCG). It is the first set in the OCG's 9th series, following Primal Origin, and followed by The New Challengers. The first Booster Pack in Series 9 and Yu-Gi-Oh! ARC-V. Introduces many cards from Yu-Gi-Oh! ARC-V. Introduces Pendulum Monsters and Pendulum Summoning to the game. Introduces cards used by Yuya Sakaki, Zuzu Boyle, Gong Strong and The Sledgehammer. The TCG version includes cards used by Girag. Contains members of the "Artifact", "Archfiend", "Batteryman", "Battleguard", "Number" and "The Agent" archetypes and the "Djinn of Rituals", "Monarch" and "Wight" series. The OCG version contains members of the "Djinn", "Heroic Challenger", and "Star Seraph" archetypes. The TCG version contains members of the "Fishborg", "Gaia The Fierce Knight" and "Lightsworn" archetypes/series. Introduces the "Melodious", "Performapal", "Shaddoll", "Superheavy Samurai", "tellarknight" and "Yang Zing" archetypes, along with the new Wyrm-Type. The TCG version introduces the "Burning Abyss" and "U.A." archetypes. The Korean version introduces the "Elder Entity", "Old Entity", and "Outer Entity" archetypes. 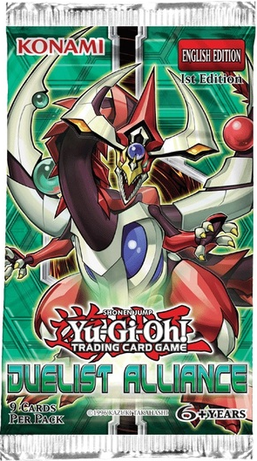 YGOrganization - [OCG] Are You Ready for Arc-V? This page was last edited on 6 January 2019, at 22:39.